How Do I Camouflage My Airsoft Gun? How can I camouflage my Airsoft equipment, please? Thank you! Hi Mikey, thank you very much for your question! 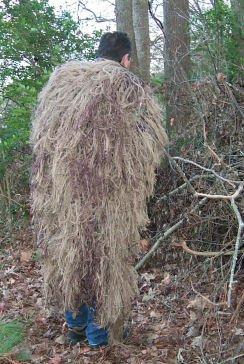 There are a few different ways to camouflage an Airsoft gun. One is to paint it using spray paint. You can either do this by cutting tape into whatever shapes you want, then apply them to your gun. can follow the same procedure but without the tape. Some people are afraid of using paint because it CAN ruin your gun if you don't paint right so another way is to cover it with different items like cloth, string, or even real leaves and twigs. When using cloth, cut it into skinny strips, take a few different colors and wrap then around your gun. The colors you use have a big affect. In woodland/forest type areas, you could use darker colors like different shades of green, different shades of brown, black and whatever other kinds of colors are in the the field you play on. In more of a desert kind of area, colors that you could use would be yellows, small amounts of orange, and maybe tan. This is mostly used for snipers that cannot be seen. Now, string isn't very heavy, so it can be a good alternative. The only downfall is finding the right colors and you have to use a lot of string. The colors are pretty much the same for string as they are for cloth. In woodland/ forest type areas, you could use darker colors like different shades of green, different shades of brown, black and whatever other kinds of colors are in the the field you play on. you could use would be yellows, small amounts of orange, and maybe tan. Leaves and twigs are probably the easiest and most efficient way to do it. If you know what the field looks like you can plan for it. Use clear scotch tape or glue to secure the items that you are using to your gun and the scope if you are using one. Leave the mag free of all this stuff because you want to make sure it slides in and out of the magwell easily. This guy (in the video) had bought all of this stuff but it works just as well with cloth or whatever you are using. Comments for How Do I Camouflage My Airsoft Gun? Hi, I did not ask this question, but just wanted to thank you very much for your response on this, bec I want to know the same thing. I'll be back with a few airsoft guns questions, also.